I think the most important part of a skincare system is the cleanser. If it doesn't work, I usually forgo the rest of the skincare line. HaHaHa I have nothing but accolades for Jurlique's Purely Bright Cleanser. Let me tell you why. It's creamy. It lathers well. My face felt CLEAN after using it. It rinses clean!!! There is no residue after you wash it off. Another plus is my face doesn't feel dry after using it. It has a scent, but I really can't describe it. It just smells like cleanser. HaHaHa Does that make scent sense? When I first started this program, I confided in you that I was having some issues with my skin. Those issues included dryness, breakouts, dark spotting/scarring and redness. I started using Jurlique Purely Bright on 1/25/13. I snapped a mug shot, I mean picture of myself on that day and then I took a picture on 2/13/13. In the short amount of time, this cleanser has helped with my problem areas. I plan to continue using it. If I had to think of a negative, you may initially experience some "purging" of the skin upon using this cleanser. Purging is when a pimple or breakout may form. It occurred within the 1st week for me, but I've been clear ever since. Also, when I press my fingers against the skin on my face, I don't feel any potential outbreaks (bumps) underneath. You guys know I love you, if I put these bare face pics up! LOL I know there's a slight difference in lighting for these pics (flash was not used. only natural light), but if you concentrate on my chin in the 1st pic, you'll notice the breakouts and dark spots have really diminished. My skin does look brighter, it feels supple, I have a healthy glow and there seems to be more clarity. I'm quite impressed after only 20 days. I still have some discoloration on the side of my cheeks, but it has dissipated since I began using this product. What do you guys think? To order, click on the Jurlique advertisement in my sidebar or the picture of Jurlique cleanser on the right. Thanks. Look for an email from me today. Thanks! If I hadn't just stocked up on my current skincare I'd be buying that cleanser! You look lovely dear! I totally left my Jurlique cleanser at home and haven't tried it yet. I'll try it soon! Great review , your skin looks amazing . You do fabulous posts kim,cleansing is so important! If it works it is definitely a keeper in my book:) Have a great weekend! Hi Kim, I love how thorough your reviews are, you should write for a beauty mag because you are always very honest, concise and brave enough to try new products! I can actually see the difference and glow in your skin! Hey Kim, I just love reading your reviews! They are so informative and honest! hehe if I can find this in SG I might just get it because it sounds really fantastic! Great review! Glad to see this product made a difference (so few do!! Omg). You look lovely sans makeup. I'm a bit envious. Sigh. Great that this agrees well with your skin. Wow, looks like a great cleanser! I noted the difference Kim! your skin have a natural shine. Glad to hear this cleanser worked well for you, Kim! 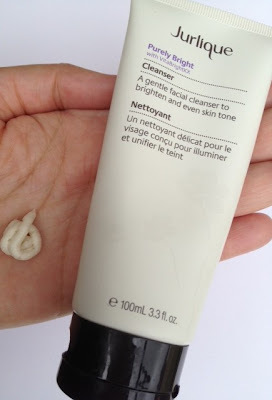 I find that it's hard to find cleansers that work really well sometimes - skin can be so finnicky! Sometimes the cleansers start out well, then my skin gets so used to it and it becomes less effective. Might have to check this one out. Hope you have a good weekend! It's so funny that you're writing about cleansers because I was just reading that you should actually cleanse both morning and nite. I have started doing that and have found it to help my skin quality. I've always heard good things about Jurlique, will have to try it in the future. Wowwwwhh your blog is very beautiful, congratulations and kisses from Spain. follow me and I will follow back? Love this post! I honestly think I may need this product! Wow, I'm really impressed by the clearing of breakouts and marks on the chin. I recently have 2 pimple scars around my mouth that wouldn't go away. They were quite huge pimples and hence the marks are difficult to disappear. It's great that you have found a product which really suits your skin and you certainly have a glow in the final picture. I've said before that I love their hand creams but I think I may try other Jurlique products sometime. I hope you are enjoying the weekend. Oh nifty...this looks like a really amazing product! Awesome review, I am always looking for products that can make my skin as clear and smooth as I wish for it to be - thanks for sharing! Wow, this seems like a great product! I'm so happy that you have gotten great results with that too, it's always exciting when you find a product that works well for you. I'll have to check it out! I am always looking for something to help combat my sensitive and redness prone skin. Wow, I love how you've done the product review and shown us the change. And you are brilliant girl, putting up bare face pics :D Kudos. Also, I can see the change in your skin. Definitely going to check this out. Cream, lathers well and rinses clean - that sounds like what I look for in a cleanser as well. The fact that it's improved your skin's clarity has got me very interested as I struggle with dark spots on my face too. Darn my Asian genes lol. Thanks for the review Kim! WOW Kim! Thanks for sharing! And we know you love us! I always wonder which brightening products really work! sounds like a good product. i doo see a difference in the pics. i am the same...if a cleanser doesn't work for me, why try the rest! Yes! I do see a diffence! That's awesome after only 20 days!